Pale yellow, brilliant gold, violet-maroon, mauve, blue-shadow and thunder-cloud grey; the colors of a summer sunset. Stormy skies —filled with ominous clouds— create some of the most memorable late afternoon displays. Light and shadow combine to bring out the best in one another. Taking this cue from Mother Nature, I like to build cloud-like backdrops in gardens with bold strokes of rich-colored foliage. By thinking beyond basic green, I can create a framework for dynamic color play in a garden design. Remember the color wheel from my earlier post on designing container gardens? Have another look at color relationships and apply those principles to a ho-hum border and spice up your summertime garden. In Romance, Opposites Attract & Often Form Passionate Unions, But When it Comes to Family, You Might Not Seat Fiesty Aunt Flora Directly Beside Prickly Cousin Curt at a Reunion. Add Quieter Members of the Same Family to the Seating Arrangement to Keep Hot Pairings from Duking it Out, While Allowing a Bit of Lively Debate Across the Dinner Table. 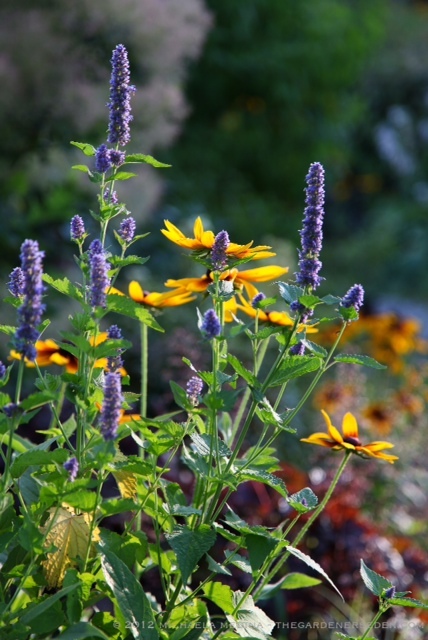 Here, Agastache ‘Blue Fortune’ and Rudbeckia hirta Happily Mingle in a Party of Mauve, Dusty Blue and Maroon. The sunny, saturated hues of late summer flowers —gold, red-orange and cobalt violet— play dramatically against shadowy foliage in complementary colors. 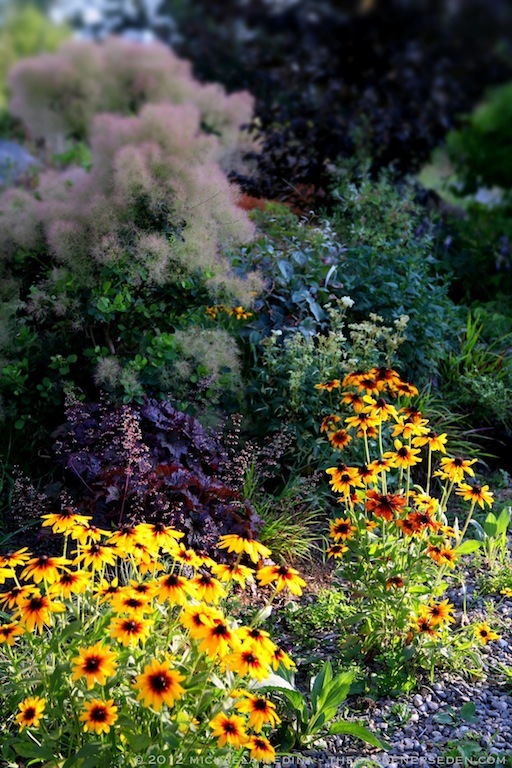 Add drama to a garden by choosing woody plants with bold foliage, and then have a look to the other side of the color spectrum when selecting perennial plants. It’s often said that opposites attract, so why not get creative when playing matchmaker in the garden? Worried that things might get garish? When working with this much color, it’s important to keep things from going too far off the deep-end. Avoid solar-glare and the need for sunglasses by adding cool splashes of silver, blue-grey and sparkling mint to balance the show. Like the idea? Have a look at smokebush (Cotinus coggygria), blue-leaf witch alder (Fothergilla ‘Blue Shadow’), copper and maroon-hued beech (Fagus sylvatica cvs), ninebark (Physocarpus opulifolius cvs), and ice-blue conifers for a bit of storm-cloud inspiration and contrast for summer’s brightest colors. 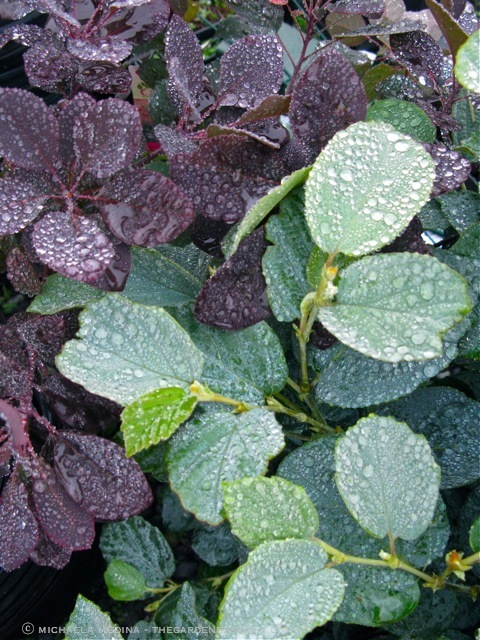 Foliage in Moody, Storm-Cloud Hues can Balance Out the Blinding Brightness of Summer’s Hot Floral Explosion: Cotinus coggygria ‘Royal Purple’ and Fothergilla ‘Blue Shadow’ form a Soothing Backdrop for the Garden’s Bright July Flowers. You are currently viewing the archives for Monday, July 23rd, 2012 at The Gardener's Eden.